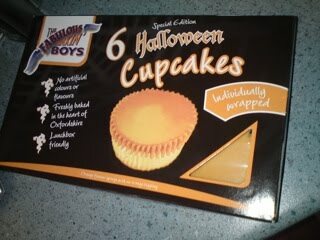 I do like the Fabulous Bakin' Boys cupcakes. They also have a very good brand image and website with games that was not blocked at work so could be responsibly enjoyed during breaks. 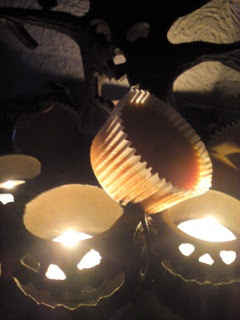 Essentially they are your typical individually wrapped cakes but there is something magical about the icing. I've never quite put my finger on it, maybe there is some kind of oil in it, but it's more of a fondant and really quite a joy to eat in all its flavours. For Halloween they have released a box of a single flavour which is orange in colour. As these are quite pale I did wonder whether they had thrown a curve-ball and gone with pumpkin, but they are just a repackaged version of the orange flavour ones. 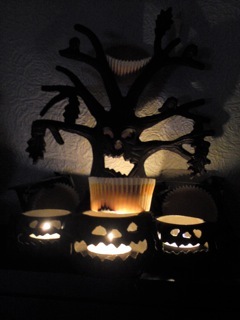 These are quite nice (even when you have burnt them on the candles by mistake) ordinarily, but as the individual wrappers have little ghosts on them they are very suitable to give to guests and Trick-or-Treat visitors that dare to come to the door. I think my scary tree shows them off well, but I had to move them quite quickly as they did start to burn. While it's a great little souvenir my parents brought back from America and makes sure that you attract a few more kids after sweets than usual by letting them know you are open for business it makes a terrible cake stand. I plan to light it using my sun jar instead of candles so that it's not quite as dangerous to have in the window for two days. But only those kids who dress up properly deserve one of the Halloween Cupcakes, they are just too nice! It is a pity though, that none of the companies here seem to have the courage to try some real Halloween flavours such as pumpkin or toffee aplle. Most just repackage their stuff. :( I am by no means a Halloween fan but would love to see more innovative stuff if they do bother to make Halloween themed products. Anne - Yes there does seem to be a theme of safe Halloween products this year, but I think there is still a better selection than last.